eSign Genie is a secure and legally binding e-signature solution for companies of all sizes. It is web based and has many features useful for e-signing and sending contracts. Time saving features include reusable templates, ability to send one or more documents together for e-signature(s), sending attachments such as photos or supporting documentation, sending an online embedded link, bulk sending for e-signatures and integration with Google Drive and Dropbox. eSign Genie provides security through its 256 bit encryption, optional email verification, tamper-proof pdf, audit trail and certificate of completion. The extensive and easy to use APIs provide the ability to integrate with any software or website seamlessly and also make it is simple for non-techies to embed code to integrate e-signatures into their applications. I have used different e-signature sites for the past couple of years. Not a big user, dozen or so times a year. I have a small real estate business so I need to have leases signed etc. There are 3 areas that distinguish one e-signature provider from another in my experience: price, customer service quality and availability, and site security. In these three elements, eSign Genie is superb and superior to all others I have tried. For site security, they have more built-in layers of protection and precautionary measures than their competitors (this does make their software slightly more complex to work with, but it's not hard to pick it up) For price, they offer paid packages, as all others do, but they also provide a free option. I'm sure it doesn't have the bells and whistles of the paid packages, but it does the trick just fine for simple documents signings ' and free is a great price. For that alone they deserve to be applauded. But what really sets these guys apart, is their standard of customer service. Truly impressive. Quick example of this. I sent out a document. Notifications came in as the tenants signed. Then a notification saying the document is executed available for download. I open my account and the document is there, along with a separate security certificate, which I opened first. I then opened the executed document. Only to find it was blank of any signatures! So I either have to re-send the document to my 4 tenants and tell them to sign again. Or I can try to reach out to customer service and ask what happened here and can you pull my document out of cyberspace? Now this is happening on a Saturday morning mind you. As I hope not bother my tenants, I decide give their customer service a try. Sent an email, thinking I might hear back from someone on Monday with what can be done. Couple hours later I get a reply from eSign Genie. Mahender Bist writes to say our technicians are checking into this, give some time please before you re-send your document. The next day, Sunday now!, I get another email from Mahender. Our technicians have recovered your document and discovered what caused your glitch. Please check your account and thanks for your business. First time user, free user, writing customer service on a Saturday, problem resolved on Sunday. So no Mahender, it's me that wishes to say thanks - to you and your team for your astounding service standards and fabulous software service provisions. Like many family owned eCommerce businesses, we have a large reach. The internet allows us to contract with clients all over the globe, but paperwork is a massive draw-back. Having looked at several 'big name' services which were riddled with bloatware and priced accordingly, I was happy to finally discover eSign Genie - with it's straightforward, no-nonsense pricing and simplified tool-kit The software allows us to send our License out for signature with no hassles to us or our clients and does not force them to download an app ...or trial ...or subscription - they simply sign it I wish more companies would understand the benefits of switching to paperless contractseSign Genie helped me to quickly and easily transition from the hassles of using paper-based contracts and licenses for our growing audience of international customers At MemberGate.com, we license our software to clients all around the world and using paper was no longer an option because the hassle it caused was a barrier to sales I wished more people would use it, instead of expecting people to print (?) their multi-page documents, sign them and then use scanners (!) or more typically smartphones to photo each of the pages so they can be emailed back...or worse, use the post! eSign Genie helped me to quickly and easily transition from the hassles of using paper-based contracts and licenses for our growing audience of international customers At MemberGate.com, we license our software to clients all around the world and using paper was no longer an option because the hassle it caused was a barrier to sales I wished more people would use it, instead of expecting people to print (?) their multi-page documents, sign them and then use scanners (!) or more typically smartphones to photo each of the pages so they can be emailed back...or worse, use the post! Thank you for being a customer and for the review. To response to your comment about ability to add a standard text from me to our outgoing email, eSign Genie always had a functionality called Notification Templates/Email Templates. You can easily create customized email templates (Navigation: Setting> Notification Templates - Create New). You can watch a video, check out our knowledge base, join our daily 12 Noon PST webinar or simply call us to understand this or any other functionality. Very good indeed. Being able to have our customers sign legally binding contracts easily, digitally, on any device under the sun and have copies of the finalised contracts be delivered to the emails of the signees upon execution has really been a game changer for our business.It is exceptionally well designed and thought out. You can really tell that eSign Genie has been written with the requirements of the users in mind, not your typical, big company "here's what we can do irrespective of what you actually need" mind set. All of our requirements were already integrated into the software, which is clearly the result of listening to users and implementing their requests. The end product is extremely easy to use and our customers have commented on the improvement to our whole business process that it represents. It is exceptionally well designed and thought out. You can really tell that eSign Genie has been written with the requirements of the users in mind, not your typical, big company "here's what we can do irrespective of what you actually need" mind set. All of our requirements were already integrated into the software, which is clearly the result of listening to users and implementing their requests. The end product is extremely easy to use and our customers have commented on the improvement to our whole business process that it represents. E-Sign was very receptive to our requests and found a workable solution to our issues and concerns. We even considered them for other projects and ideasIt provides lots of features as is, an can be custom tailored to fit our needs. We made a request for special features within the form that we could not find elsewhere. We did pay a little extra for their programmers to code the custom features for us but the price was very fair and well worth the money. We wanted the ability to send out a notification to certain individuals depending on what was checked on a form. Many other similar services did not even offer the option for such customization. E-Sign did not have this feature at first but after we made the request, they got to work on making it a reality. Pricing on Professional Plans start at $8-10 per user per month, paid monthly or annually. Get in touch today for our extremely competitive Bulk, High Volume and API pricing! Below are some frequently asked questions for eSign Genie. Q. What type of pricing plans does eSign Genie offer? Q. 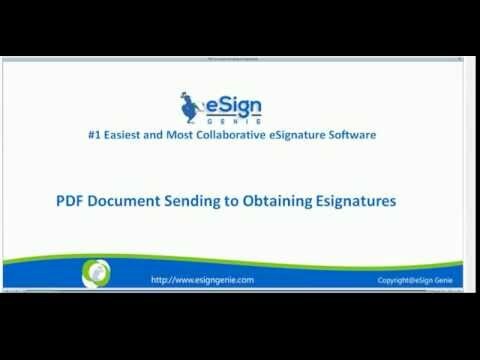 Who are the typical users of eSign Genie? Q. What languages does eSign Genie support? Q. Does eSign Genie support mobile devices? Q. Does eSign Genie offer an API? No, eSign Genie does not have an API available. Q. What other apps does eSign Genie integrate with? Q. What level of support does eSign Genie offer? Q. Which apps is eSign Genie compared to most often?